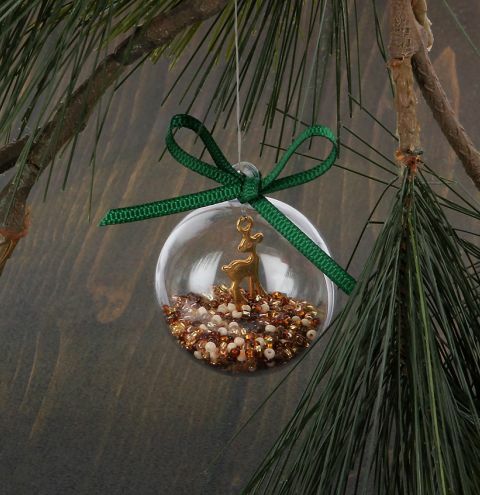 Learn how to make a cute little reindeer decoration for your tree this Christmas using your favourite, festive seed beads and our NEW fillable ball charms. Pour all of the seed beads into one half of the ball. Cut a length of thread approx. 40cm and fold it in half. Find the middle point and insert it through the loop of the reindeer charm. Then pass the ends of the thread through the loop you just passed through and pull to secure the larks head knot. Place the reindeer in position and re-create the same knot but this time to secure the thread to the loop on one half of the ball. Carefully fit the other half of the ball and close them together, without spilling any seed beads! Tie your threads in a knot approx. 4cm from the end. Cut a 30cm length of ribbon, thread it through the loop of the bauble and tie it in a bow to finish your decoration. Trim away the ends of the ribbon for a cute little bow.